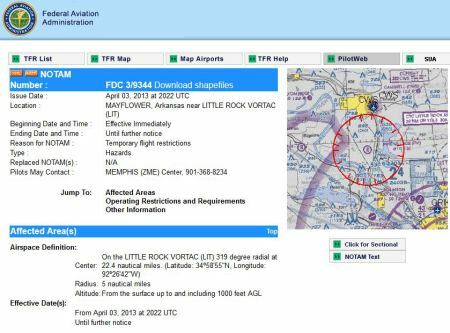 And, to the right is a screenshot with details of the flight restrictions, before the TFR was cancelled. Media and independent scientific analysts may want to overfly those areas where they can either record photo or video images (showing visible bitumen debris, cleanup materials and procedures, or work progress), or where they can sample air for measurable diluent contaminants. This particular dilbit spill is relatively localized, generally limited to a stretch of land roughly a mile long. The western end of the pollution/cleanup area is the pipeline burst location, at the north end of Shade Tree Lane, in Mayflower, AR. The east end is a boom at the outlet of the pipes flowing under Highway 89. Those pipes connect water in the contaminated arm with the main body of Lake Conway. The TFR size was clearly excessive. The five-mile radius was far more airspace than was needed. The stated reason for the TFR was to manage media flights and exclude non-media flights, so that the helicopter being used with the cleanup would not be in danger of collision with media flights. Given the localized impact, a one- or two- mile radius TFR would have been far more appropriate. FAA granted airspace control to a private citizen, who works for pipeline owner ExxonMobil. This created the appearance that FAA was serving corporate interests before citizen interests. Although the stated purpose of the TFR was aviation ‘safety’, the TFR appeared to be blocking public access to information related to other safety aspects, such as exposure to hazardous chemicals. This would include not only aerial imagery, but also air sampling for residual benzene and other light hydrocarbons. It seems quite clear that the probability of capturing a dangerous benzene level would be much lower if sampling was not allowed below 1,000′ and within a 5-mile radius. The probability of a midair collision at 1,000′ altitude will be increased when pilots adjust to minimally comply with the arbitrarily imposed restriction. Media flights will want to be at the lowest legal altitude, thus will all tend to share the same altitude while on their media missions. One of the simplest and most effective forms of safe air traffic control, separation by altitude, was thus discarded with this TFR. Additional Info Photos, maps and links related to the spill. This entry was posted in Accidents: nonfatal, Environment, ImpedingCitizenProcess, Off-Airport by reformfaanow@gmail.com. Bookmark the permalink.